Owens Community College welcomes donors who desire to establish scholarship or program funds which benefit students or programs at the College. We encourage donors to consult with the Foundation staff when establishing fund criteria to ensure the fund will meet the donor’s expectations and fulfill a need at the College. Donors have the opportunity to set the criteria for your scholarship. For example, donors may wish to direct their scholarship fund to reward high school students or students who need financial assistance to attend college. Other criteria to consider are the student’s major, grade point average, and whether the student is enrolled full or part time. Program funds can assist academic programs and colleges with faculty development, new technologies and other needs which may not be covered through regular college operations. Donors who wish to help students and Owens Community College through a lasting legacy may want to establish an endowed scholarship or program fund. The scholarship or program fund may be established in your name, the name of an individual you wish to honor, or anonymously. 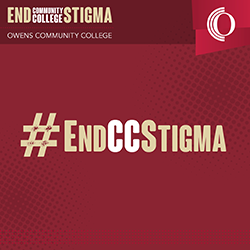 Endowed funds at Owens Community College may be established starting at $10,000. Donors can start building their fund with less than $10,000, however, no awards can be made until the fund has at least $10,000 and no earnings will accrue until the fund has at least $5,000. Other restrictions on building an endowed fund with less than $10,000 may apply. Please call the Foundation for more information. The guiding principal of an endowed fund is that the corpus remains and generates earnings, which help to grow the fund and award scholarships or program grants annually. Once established, the fund will be managed by the Owens Community College Foundation. The Foundation’s Board of Directors follows an established spending policy and approves an annual spending percentage between 3 and 6 percent. There is an annual one percent administrative fee for endowment management. Donors who wish to expend the principal of their fund over a term of eight or more years may choose a Scholarship or Program Fund Endowed for a Term of Years. A term endowment is invested, however, the donor is permitted to “spend down” at a greater rate than the Foundation spending policy. The fund is generally depleted after a certain term (eight years or longer). There is an annual one percent administrative fee for management of the Fund. In Operating Funds the entire amount may be used at any time for the purposes designated by the donor. Donors can make a one-time contribution or give annually to the Fund. This Fund does not have investment earnings and there is no management fee. For more information regarding scholarship or program funds, please contact the Foundation Office at (567) 661-7603 or foundation@owens.edu.